Remedly is a cloud-based practice management solution for dermatologists, medical spas, plastic surgeons, and their patients, which is designed to streamline medical practices and improve patient care. The integrated solution encompasses functionalities including electronic health records (EHR), practice management, revenue cycle management, an online patient portal, marketing, eCommerce, analytics and reports. Remedly’s practice management tools include an integrated scheduler, task management, and real-time inventory management. The EHR system allows users to customize templates to record patient visit notes, and capture before and after photos of patients. Patient demographic information and medical histories can also be recorded and maintained. Lab tests can be ordered electronically, and controlled substance medications can be prescribed. Remedly’s revenue management tools allow users to manage quoting, invoicing, payments and refunds, insurance eligibility verification, claims processing, and electronic submissions. Claims statuses can be tracked in real time. 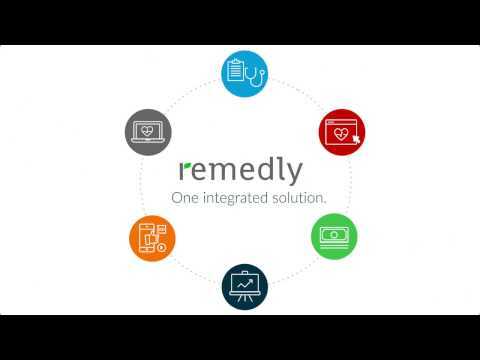 Remedly offers a patient portal, which provides patients with online access to important information, follow-ups, secure messaging, electronic forms, birthday specials, and more. SMS and email reminders ensure that patients are automatically notified of their upcoming appointments. Users can access a range of reports and analytics, including practice, patient activity, and claims reports, to track performance metrics and submitted claim statuses. Incredibly good. These guys really care, and they have produced an outstanding product. Again, they are the only ones out thinking outside the box when it comes to creating a subscription billing option. That's cool. But the electronic health records system is so smooth, it has saved us countless hours. Awesome system.I spent months researching dozens of the top systems out there, and Remedly had what no other system could offer - the capability of handling our membership pricing model, combined with our need to do efficient insurance billing, combined with our need for excellent electronic health records. Remedly was the ONLY system out of all of them that could handle these needs. And they handled them perfectly. Integration has been flawless. But above all else, the kindness and decency of the team at Remedly in terms of bending over backwards to accomodate our needs was really the best part of working with Remedly. I spent months researching dozens of the top systems out there, and Remedly had what no other system could offer - the capability of handling our membership pricing model, combined with our need to do efficient insurance billing, combined with our need for excellent electronic health records. Remedly was the ONLY system out of all of them that could handle these needs. And they handled them perfectly. Integration has been flawless. But above all else, the kindness and decency of the team at Remedly in terms of bending over backwards to accomodate our needs was really the best part of working with Remedly. I sat and thought about the cons, and I seriously struggled. Every time we thought we'd discovered a limitation in the system, it turns out we just weren't understanding it correctly, and it was in fact much better than we'd realized. There are so many cool features to the system. I guess if I had to pick one thing that was not entirely optimal was the scheduling had to be in 15 minute increments, but they are about to fix that anyway. My experience with Remedly has been fantastic. I have had the oppurtunity to have my concerns addressed by the CEO who is more than willing to spend time with the users of Remedly in attempt to constantly improve it.Having come from one of the largest EMR/practice software vendors where there was virtually no support and major issues would take days to resolve if ever, Remedly's customer service is exemplary. I can always have my concerns addressed within hours. Sometimes minutes. The don't nickle and dime you with every update, new component, new user, new device etc. One monthly fee. This has obviated the need for other complementary softwares like Solution Reach as this functionality is built in to Remedly. Having come from one of the largest EMR/practice software vendors where there was virtually no support and major issues would take days to resolve if ever, Remedly's customer service is exemplary. I can always have my concerns addressed within hours. Sometimes minutes. The don't nickle and dime you with every update, new component, new user, new device etc. One monthly fee. This has obviated the need for other complementary softwares like Solution Reach as this functionality is built in to Remedly. New software updates sometimes have some bugs. This product has vastly enhanced my efficiency by allowing me to offload my schedule and have most of my post-operative patients check in with virtual follow-ups, which they prefer anyway. My main bottleneck is my time and Remedly has freed up a ton of that. This product is in need of a user interface overhaul, which I understand is coming in 2019. Scott, thank you for taking time to sit down and write us a review. We very much appreciate it. You are correct, the software has been getting a full face-lift. Luckily, it's a short recovery time and the new look is already being rolled out. Must have for our practice after using it for the past 3 years, new staff get up and running with it fairly easily. Very reliable and look forward to future releases.Solid cloud based integrated software for all aspects of plastic surgery. So many features it keeps everyone informed about our patient flow from scheduling to invoices and charting. For executive management it provides real time analysis of practice trends and identifies staff productivity. Solid cloud based integrated software for all aspects of plastic surgery. So many features it keeps everyone informed about our patient flow from scheduling to invoices and charting. For executive management it provides real time analysis of practice trends and identifies staff productivity. I hope the mobile interface will adjust to screen views better with future releases. Remedly has offorded me the opportunity to take back control of my practice with a simple, streamlined and integrated cloud based program. It’s multifocal Approach to patient care and ability to have everything within the patient’s chart at your fingertips including; photography, EMR, EHR, schedular, point of sale, online store capabilities, use of Siri on your mobile device. It’s multifocal Approach to patient care and ability to have everything within the patient’s chart at your fingertips including; photography, EMR, EHR, schedular, point of sale, online store capabilities, use of Siri on your mobile device. Contact Remedly for detailed pricing information. • The patient portal provides HIPAA-compliant access to online messaging, forms, follow-ups, before and after photos, consultations, and more. • With the revenue management module, users can monitor the financial performance of their practice along with quoting and invoicing, payments, refunds, processing of insurance claims, and more. • Real-time updates in the practice management module keep users informed about their practice’s inventory status. • Doctors and practitioners can instantly determine patients’ insurance benefits coverage and eligibility. • Insurance claims can be submitted to payers electronically, and users can view claim status in real time. Below are some frequently asked questions for Remedly. Q. What type of pricing plans does Remedly offer? Q. Who are the typical users of Remedly? Q. What languages does Remedly support? Q. Does Remedly support mobile devices? Q. Does Remedly offer an API? No, Remedly does not have an API available. Q. What other apps does Remedly integrate with? Q. What level of support does Remedly offer?